A dental bridge is one of the options that you have when deciding how to deal with a missing tooth or teeth. The replacement of these missing teeth is necessary in order to maintain the proper mouth functions. Tooth loss can affect the way you eat, speak, and the alignment of other teeth in your mouth. A bridge, just like the roads that connect the mainland to the islands, is a link or connection between two permanent structures. A traditional dental bridge is very similar in that it attaches the restorative teeth (pontics) to the natural teeth on either side of the gap. This bridge replaces your missing teeth, closing the gap and restoring your smile. Bridges are often constructed of gold or metal foundations with porcelain fused to the foundation. This ensures that the bridge will support the normal functions of the mouth. 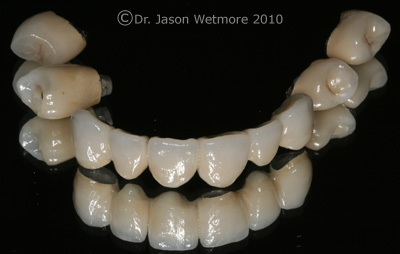 Although with recent 3D Cad/Cam milling technology our technicians can fabricate all porcelain bridges out of zirconium. Maryland bonded bridges are an option when the adjacent teeth are in great condition and esthetics is primarily a concern. They include an artificial tooth that is held in place by a bonded metal frame. Metal wings on each side of the artificial tooth are bonded to your existing teeth. In addition to the obvious esthetic benefits of replacing a missing tooth, a dental bridge will also improve your ability to chew and speak. In a recent study published in the Journal of the American Dental Association, bridges were shown to reduce the risk of losing teeth that are adjacent to a missing tooth. In addition, bridges can help keep your jaw and face from changing shape, as they tend to do when a person has missing teeth. An impression of your prepared teeth is taken, which our laboratory technicians will use to hand craft your final restoration. A temporary that resembles your natural teeth will be placed for you to wear until your final restoration is delivered. On your second visit, your bridge will be fitted to your teeth and any necessary corrections or adjustments will usually be made on that same visit, and the bridge will then be cemented. A review of the literature will show that bridges typically last anywhere from 8 to 15 years and can last even longer if you maintain good oral hygiene by brushing and flossing regularly. The most important factor in the life of a bridge is preventing recurrent decay which is relatively easy with good hygiene and regular dental cleanings and checkups. Dental bridges are typically partially covered by insurers. Please speak with our insurance coordinators to find out more about your particular situation and coverage.